The Freedom Charter remains as one of the well-known guiding documents in South Africa. Education remains as one key priorities of the 1955 peoples’ aspiration document. 50 years later, the social systematic injustices parts of that treasured documents still remain a national wish list. 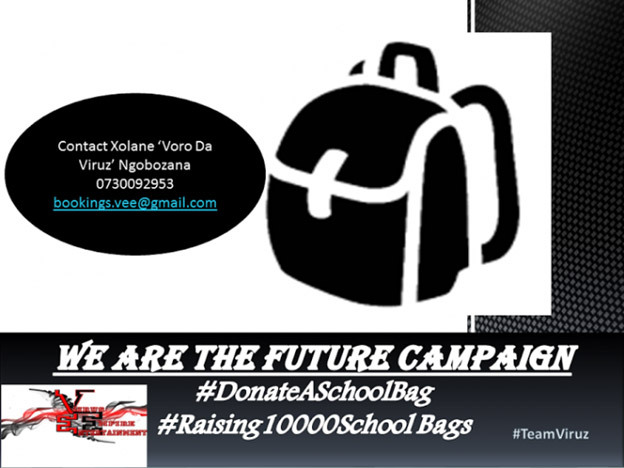 To address those injustices, a Johannesburg based social entrepreneur and Activator Xolane Voro Da-Viruz Ngobozana in partnership with Nqobile Katlego Enterprise have launched a campaign called “donate a school bag”. The initiative is meant to raise more than 10000 School Bags and Donate them to more than 50 School across South Africa and help poor children in South Africa. The project’s aim is to raise 10000 school bags and donate them to more than 50 schools in South Africa. Each schoolbag will be filled with stationery, learning resources that will enable a child to write, draw, color, calculate, so they can express themselves and above all learn. We also hope to assist some additional treats. This is done with a hope that new school bags, material and books for students to fight the poverty overwhelming child poverty rates. According to Ngobozana, low-income areas of South Africa, school supplies are a luxury. Most of the young children in these areas are presented with small bag of limited, mismatched school supplies. The simple content of “DONATE a SCHOOL BAG” has the power to transform a child’s life – the very Bag you donate could help to create a future doctor, politician, humanitarian, or even your future colleague. The “donate a school bag” has received great public reception. The intervention resonated with number of activators within education fields. Some of the schedule fundraising events include concerts, donations. The next event will be on 6th February 2016 at OR Tambo Cultural Precinct and donation will start from R30 per person. There will also be a music competition for upcoming artists to be featured on Donate A School Bag Compilation Album.